No one likes to hang around The League of Nations backstage because they are really depressing. Vince McMahon will disown any child of his unless they post at least 5 workout videos per week on social media. To continue the decline of Total Divas next season will focus more on the boyfriends and brothers of the stars. TakeOver: Dallas is scheduled to end with The Balor Club carrying Triple H on their shoulders and Shinsuke Nakamura placing his Wrestle Kingdom crown on Triple H’s head. Alex Riley wants to fight a live tiger in a cage at Wrestlemania weekend to send a message to the WWE Universe. WhatCulture stole Joey’s Fuller House gif. The proof is in the low quality image. CM Punk has frequent nightmares about The Miz making it to UFC before him. Dixie Carter is open to someone purchasing TNA as long as they continue making action figures of her. Lance Storm comments intentionally controversial opinions on Facebook posts then deletes it once everyone starts arguing with each other. This entry was posted in ScoopZone Elite and tagged Lance Storm, ScoopZone Elite, WWE on February 29, 2016 by Tim B. Following the timeline of the last Dirt Sheet History looking back at January 2010, we get a glimpse into the top scoops from February of 2010 as we read Dirt Sheet History. Reminder that you can find all past editions of Dirt Sheet History looking at 2004 through 2009 right here. Now enjoy February 2010! TNA President Dixie Carter explained that TNA Wrestling is going up against a corporate juggernaut that will stop at nothing to put them out of business. With everything that WWE has going for them, Carter believes her company has a better in ring product and knows what the fans want. This entry was posted in Dirt Sheet History on February 24, 2016 by Joey. Giving their thoughts and predictions on what to expect from the PPV incorrectly known as Fastlane are members of the site @JoeyOnEarth, @TimWelcomed and @TomBlargh. The rivalry between Kalisto and Alberto Del Rio has been met with its fair shares of ups and downs. I’m not particularly excited about this but it’s not something I plan to skip. Kalisto being champ is something new and cool so I’m hopeful of that continuing. I like the idea of Kalisto as champ. He fresh and I really think he has potential. This feud has just been odd though. Every match is a mixture of cool moments and really bad flubs. ADR has been pretty pathetic this go-around. This seems like the blow-off. I’m pretty happy about that. I can totally watch these two try this out one more time. There are worse ways to spend my time. How about we do Kalisto vs Neville next? I can’t do it. I’m sorry. I like Kalisto and I wish they’d give him someone more interesting to scrap with because Berty D.R. is doing nothing for me right now. Best of luck to the both of them though (with the luck divided in Kalisto’s favour on an 80/20 split). This should be a humorous and interesting segment. I’m very happy this is happening instead of another random match with the Usos. My assumption is this segment is used to set up a TLC Match between The New Day, Usos and Dudz at Wrestlemania. Prediction: TLC WM match is announced. Sure, why not? The New Day are fun to watch no matter what. The Dudleyz will have to join in though… and we’ll have to hear references about those old TLC matches again. Alright, maybe this won’t be all that fun. Prediction: Dudleyz show up and I fix some supper. Mostly, I’m hoping we get a fantastic sneak peak at Edge and Christian’s new Network show, because I have a feeling it will have shades of Swerved to it and that will be just wonderful. New Day interacting with Attitude Era stars is always a pleasure regardless though, so this should be fun (until the Dudley Boyz come out). Prediction: I ask Tim about his supper. This entry was posted in More Things!, PPV Preview and tagged Brock Lesnar, Dean Ambrose, Fastlane, PPV Preview, Roman Reigns, WWE on February 20, 2016 by Joey. Vince McMahon is donating all money Titus O’Neil will lose in his suspension to Donald Trump‘s campaign. Neil deGrasse Tyson is working on a twenty page paper on why Stardust is not realistic because an alien would dominate pro wrestling. The Big Show has some heat backstage after cutting a face promo on the second Tuesday of February. It is clearly stated in his contract that he is a heel on the first Friday, second Tuesday, and entire last week of every month. Eric Bischoff, Vince Russo and Jim Cornette all see potential in Alex Riley. A reality show has been pitched for the WWE Network featuring the ghosts of Bill DeMott and Bull Dempsey haunting The Performance Center. The most recent NXT roster cuts were to free up money for Baron Corbin to finally have a motorcycle to drive during his entrance. 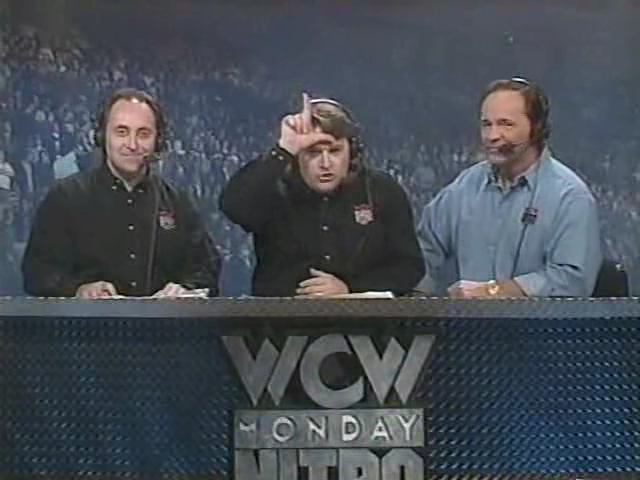 What does the best commentator in wrestling history think about you? Find out here. Lance Storm rips the tag off every pair of $700 jeans that Chris Jericho purchases before he can try them on. This entry was posted in ScoopZone Elite and tagged Lance Storm, ScoopZone Elite, WWE on February 15, 2016 by Joey. Hi, it’s @JoeyOnEarth. The recent retirement of Daniel Bryan has led to a bit of reminiscing on my part and I decided to share some of my favorite moments of his career. Dawning on the realization that we’ll never see another Bryan match was instant heartbreak but recalling all the special times he provided in a wrestling ring has put it in a more positive perspective for the closure of my favorite wrestler. My introduction to Bryan Danielson was in 2006. I actually wanted to dislike him. This was around my early stages of being welcomed into the “internet community” of wrestling fans. I’ve always had a thirst for pro wrestling and would watch literally any show that featured wrestling from childhood. WWE and TNA were the only companies on my radar and around ’06, my interest in pro wrestling hit a new low. This entry was posted in More Things! and tagged Bryan Danielson, Daniel Bryan, WWE on February 13, 2016 by Joey. Get ready to travel back into time to the mysterious era in wrestling history that was one week ago! Join host Brad Ward (@BradWardFight) along with Wrestling On Earth’s own T-Boyz, Tim (@TimWelcomed) and Tom (@TomBlargh), and audio editor Scott (@SocksMahoney) on a monthly (sorta) bradserver radio show that doesn’t play by YOUR rules, big Dave! Listen below or download the podcast here by right-clicking and saving this link OR by subscribing on iTunes. In this episode, The Great Chuck Taylor Shoe Debate, we get very intimate in Tom’s bed, a royal serving of wrestling talk, the boys get excited about murder, and Brad wants to know what Scott’s up to on Valentines. This entry was posted in More Things!, Wrestling On Air and tagged Brad Ward, podcast, Wrestling On Air on February 6, 2016 by Socks Mahoney. Byron Saxton may be missing a few weeks of shows for scheduled maintenance. This is a completely normal process for all androids. The roster being depleted with injuries has led to talks of Vince McMahon returning to in-ring action against The Undertaker in the main event of Wrestlemania 32. Alicia Fox asking to legally change her name to Alicia Bella will be a huge part of the next season of Total Divas. Austin Aries is already trying to form a relationship with Triple H by setting his ringtone to Motorhead and loudly talking about Joe DeFranco‘s workouts any time Triple H is in the same room as him. Corey Graves isn’t allowed to be around Bayley’s inflatable tube men because he always tries drawing tattoos on them. Sami Zayn has become very unpopular in the locker room by trying to recruit members of NXT to start a real musical band. Click here to hang out with your pal and let it all out. Lucha Underground will begin filming Season 5 next week. Wrestling fans across the globe are worried that Lucha Underground will not get a sixth season and a movie. Lance Storm has fed fake information about Chris Jericho and Taz to each of them in successful attempts of elaborately starting a podcast war for his own amusement. This entry was posted in ScoopZone Elite and tagged Lance Storm, NXT, ScoopZone Elite, WWE on February 1, 2016 by Joey.